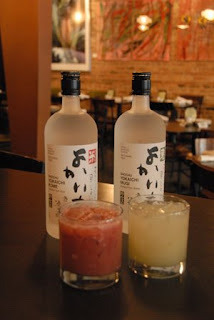 Stephanie, my Kurman Communications, Inc. partner in crime, and I got a sneak peek of Shochu (3313 N. Clark Street; 773-348-3313) yesterday. Shochu will be a unique, first of its kind small plate restaurant and lounge, named for shochu, the #1 Japanese distilled spirit typically made from rice, barley, sweet potatoes or black sugar. Shochu has taken Japan by storm! It has surpassed sake in sales, and has become the “in vogue” alcoholic beverage in New York and Los Angeles. Yesterday, Chef Josh Hansen was nice enough to let us lucky girls in to take a look around. For months, I have been excited about this opening. This visit made me even more ecstatic. Josh and Owner Lynne Wallack have really done a fantastic job of designing the interior. Green banquets line the exposed brick walls. Lynne is a big fan of photography, and she plans on filling the walls with Japanese-themed photos. Josh also led us to the back of Shochu so we could see the patio. It’s huge, yet intimate. It won’t open until mid-May, but when it does, I can envision myself spending quite a few summer nights there, nibbling on maki rolls and sipping one of Lynne’s fabulously named (after Japanese royalty) shochu cocktails. Not to mention the fact that Shochu is about a ten minute walk from my apartment… Yeah, this is going to be a great summer for Shochu. And for me. P.S. I know I’m not the only one excited about Shochu. Media: If you want a sneak peek as well, give us at Kurman a call.